Raise your Sword of Omens in the air if you were a fan of the 1980s toy line and cartoon Thundercats. Me too. 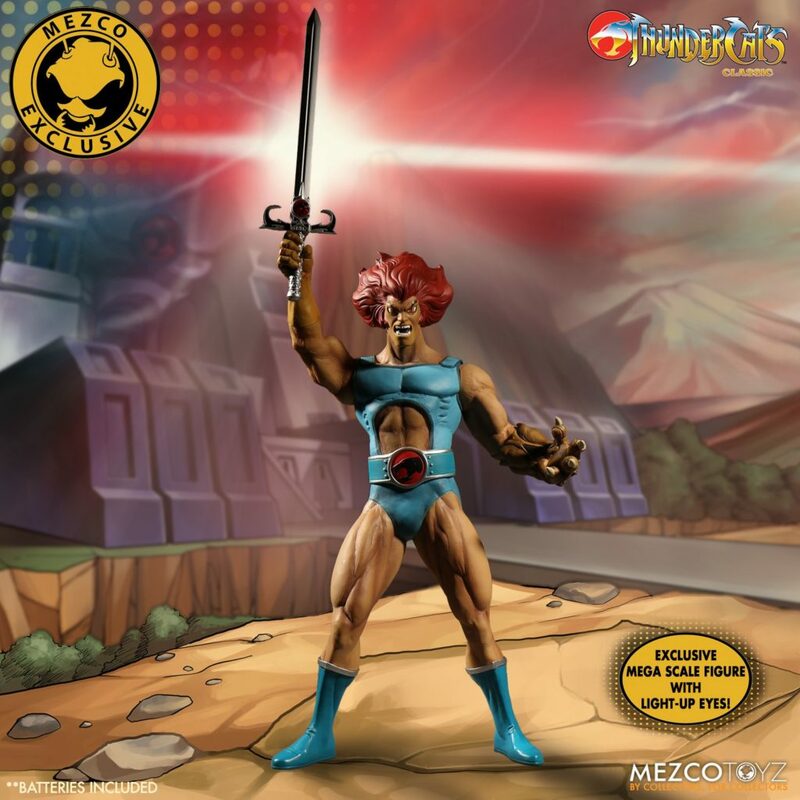 I really like what Mezco has done with their Thundercats license, and was super-excited when they announced their summer exclusive Mega Scale Lion-O figure. This figure is huge. I feel like I wasn’t quite ready for just how tall this figure would be when I ordered it. When the box arrived, it was in a much larger box than I was used to as far as Mezco figures were concerned. Lion-O is giant! Mega scale is an apt name. If you live in a studio apartment, this is not the figure for you. 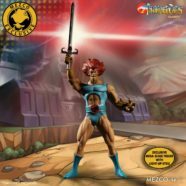 Unlike their One:12 Collective action figures, this Lion-O is not collector friendly in the sense of being able to easily remove and put it back in the box. Once this figure is unboxed, it is unboxed. The light up eyes feature is neat – basically, one head has light up eyes, the head that looks like it is shouting. You have to pop the head off the neck, unscrew a cap inside the neck socket on the head, and insert a couple of batteries (which Mezco included! Yay!). Once the batteries are in, a toggle switch on the base of the head controls the light up eyes. The eyes are bright! Even in a fully lit room, they look very bright. Not flashlight bright, but definitely “freak out a toddler” bright. 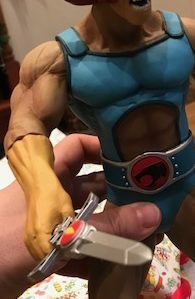 The accessories included with the figure are all must-haves: the Sword of Omens, both the short and fully extended versions, as well as Lion-O’s claw shield gauntlet. If I could change anything about this figure, it would be the articulation. I just wish we had some functioning knee and elbow joints. That said, if you are a fan of Thundercats and have the space, order this figure direct from Mezco. It’s great. At the time of this writing, it’s still in stock directly from Mezco’s website.